We humans live, move and have our being in the mind of God (Omnipresent, Omnipotent, Omniscient Consciousness). We live, move, and sustain our being by the breath of God; breath is our first priority in life. We were created in a unique fashion so that as we actively breathe the breath of God, we imprint the passive breath (soul) within our being with our unique thoughts, feelings, and experiences. In our life experiences, since the ego-personality perceives other people as being separate from ourselves, it makes us believe that our consciousness is separate from that of others; but it is not. Consequently, the rational mind of the ego-personality does not recognize oneness with the mind of others or that we all breathe in vital life from the one breath of God. Thus, it is the illusion perpetrated by the ego-personality that “veils” and ignores the oneness of humanity and our oneness with the Creator. Only by practicing focused breathing or learning to be still in meditation can one dispel this deceptive and restrictive illusion and then experience the true freedom of higher consciousness. Those who practice connected, focused breathing as explained in the paper Just Breathe, feel the peaceful serenity which pervades the body and mind when the breathing is smooth, extended and relaxed. The purpose of connecting the breaths so there is no pause at the exchange is to keep the chattering-mind and the anxiety of the emotions from interfering with this breathing meditation. When one is proficient in this connected breathing exercise, there is a deep peace and serenity which is felt in the center of the body from the solar plexus to the heart. The longer this quiet state can be maintained, the deeper the healing, physically, emotionally, and spiritually. This means that if one enters the breathing meditation with a troubled mind and turbulent emotions, he or she upon exiting the exercise, will be greeted with an entirely different perspective. All of the imagined fears or exaggerated “background” noise from the body-mind and ego will be greatly reduced. Generally, this agitation from the mind and emotions is the initial challenge the individual has when learning how to consciously breathe. One quickly realizes how little control there is over the undisciplined “chattering-mind” which interjects nonsensical thoughts and exaggerated emotions into the breathing process disturbing our peace. With consistent practice, this interference will stop and one will experience sublime states of consciousness never before felt. When focused breathing is practiced on a daily basis, one begins to experience a divine, sacred feeling emanating from within. This feeling becomes more and more pronounced the longer breathing is practiced. Connected, focused breathing is the first step toward experiencing higher consciousness or what can be described as conscious states free from the distracting influences of ego and emotions. When proficiency is achieved with the breathing exercise, one will feel peaceful, still, and composed, and this quiet state of mind will linger even after the completion of the exercise. The next step in this process is to take this peace and composure into the hustle and bustle of the world and to maintain it as much as possible. Let me explain how our peace of mind is constantly challenged by the external world. 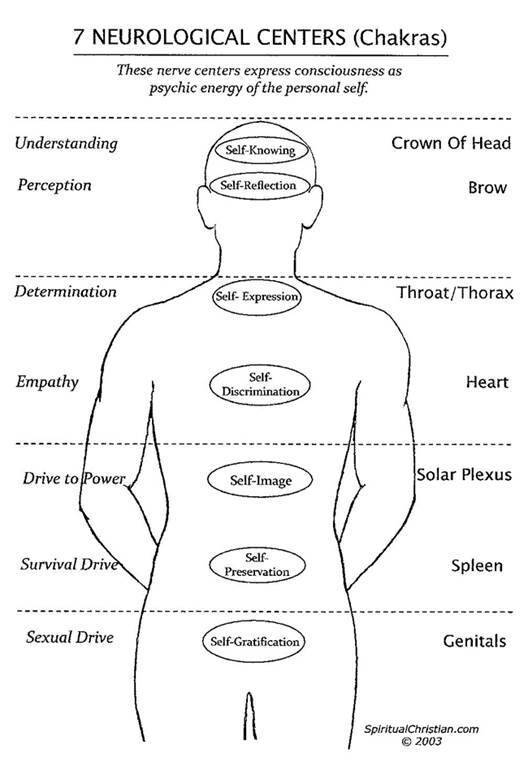 Notice in the diagram below that the 3 lowest neurological centers are “hardwired” into the physical body as the power drive, the sexual drive, and the survival drive. Needless to say, these are the most powerful forces in the body and these 3 drives govern the instincts, desires, and impulses which make the body continuously respond to the instinctual urges from the body and the sensory input coming from the world. Just as our rational mind processes external data based on sensory information, past experiences, and memory… the psycho-physiological mind of the body, our solar plexus, processes the psycho-physiological and sexual energies from other people in our immediate environment and to a lesser extent, the security of our surroundings. To make this a little more real, imagine being in a large department store or concert and an explosion goes off… the fear that will immediately ripple through that environment will be felt by everyone in their solar plexus. In a potentially frightening situation, the rational mind usually freezes and the solar plexus and instincts take over. Back to our walking meditation… when inner tranquility and composure are easily maintained in focused breathing, the next step is to take this serene state into the world. This is an exercise of “smooth breathing” in the present moment and remembering to “smell the flowers” while being in the world. In other words, learn to be fully present and composed, not letting the world draw you out into its activity thereby disturbing your serenity. The psychological/emotional challenges from the world will always come through the solar plexus; walking meditation is about learning how to manage the solar plexus. We humans are in this life and in this world to be challenged by the world to see how strong and stable we are. Providence places us in an environment which is suitable and relevant to the lessons we must learn; this will happen whether we meditate or not. It is just that by growing in self-awareness through conscious breathing and/or meditation, we are able to embrace our experiences more fully and learn our lessons so we don’t have to constantly repeat them. In the beginning practice of walking meditation, find a quiet place in nature to walk and practice connected breathing while remaining centered and composed. Walk, breathe and feel the deep serenity of the Christ Light in your heart. Gradually, let the serenity and light envelop the body and feel the solar plexus center; be like an egg with the sun at the center (the yolk) enveloped in an atmosphere of light. Just walk and be at peace. Become familiar with this state and learn to comfortably maintain it. In the beginning, there will come a point, like exercise, when it is time to relax and rest; and like exercise, keep practicing and increasing the time you can maintain the inner peace and composure. To me, this is the living symbolism of walking on the waters – the turbulence of the world. It is very difficult to be still because so many things in the outside world disturb our tranquility. We encounter the experiences of life from the external world in our solar plexus; very subtle feelings and impressions are felt about life situations, people, and various “superficial” judgment calls are made by “the chattering mind” as we go through our daily routine. This is just one of the distractions that routinely runs in our head and this has to cease during this exercise; quiet and composure needs to be restored in the present moment. Practicing being in the present moment with the Spirit will reveal our undeveloped states, such as: a lack of faith in the Spirit as we feel fear, uncertainty or insecurity in a tense situation; a lack of resolve and commitment to our ideals when we are distracted by temptations which casts doubt on our true priorities; feeling disappointment because we project expectations into the present event, experience, or person; or allowing the ego to dominate and control the present moment because we are not being selfless, open and receptive to the Spirit’s guidance. This is why we practice. After reaching a level of proficiency with the walking meditation, try the “walking in the world” challenge! Don’t be fooled by the simplicity of this exercise, it has many physical, mental and spiritual benefits, and the practice of “conscious walking’ will also help in the practice of consciously being in the stillness and presence of God. Knowledge and awareness of the Divine Presence grows the longer we remain in the stillness.